Kakao Bank and K-Bank have voiced their opinions towards legislation of banking and commerce exemption law. They are arguing for preparation of suitable conditions to continue innovation of financial industry by allowing even just internet-only banks to increase their shares as ICT (Information Communication Technology) businesses. It is interesting to see whether South Korena Government will start to ease banking and commerce policy as it is showing positive reactions towards innovative results shown by internet-only banks for the past year. Min Byung-doo and Jung Jae-ho, who are members of The Minjoo Party of Korea held a 'debate for evaluation of internet-only banks' results for the past year and their future tasks' at National Assembly Hall. K-Bank introduced internet-only bank to South Korea for the first time by operating its business in April of 2017. Kakao Bank, which was established in July of 2017, caused sensation by gathering 3.29 million members in just one month. 24-hour financial service through mobile channels and single application, simplified confirmation procedures, and convenient wire transfer acted as causes of Kakao Bank's popularity. Commercial banks have begun to improve level of convenience for their customers when started to see popularity of internet-only banks. They were clearly catalysts that accelerated innovation of South Korea's financial industry. "Internet-only banks increased level of satisfaction of customers through convenient services and competitive price and they clearly caused 'catfish effect' within South Korea's bank industry by changing strategies of commercial banks." said Dr. Kim Woo-jin of Korea Institute of Finance. "It is necessary for supervisory authorities to enhance systematic foundation for internet-only banks so that they can achieve their original goals and secure management stability." However, differentiated profit models and increase in funds were brought up as future tasks for internet-only banks. 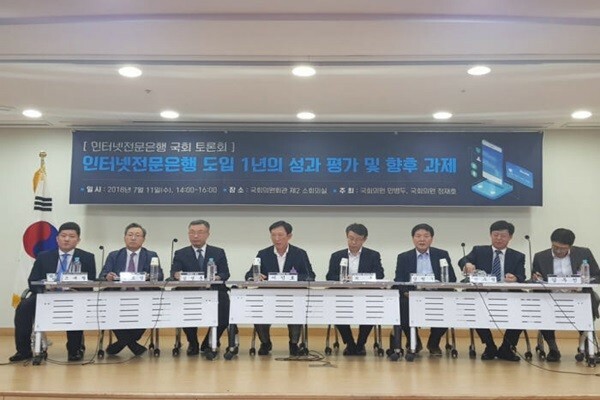 President Shim Sung-hoon of K-Bank and CEO Yoon Ho-young of Kakao Bank who participated in this debate urged for legislation of banking and commerce exemption law that is based on 'easement of shares owned by internet-only banks'. 'Exemption law for establishment and operation of internet-only banks' and 'revised plan of bank related laws' are currently pending. "Exemption law that is currently motioned has even more strict regulations than current bank related laws." said President Shim of K-Bank. "Prohibiting innovative attempts for possible risks that can arise from establishment of thorough supervisory system is not an appropriate approach from aspects of consumer benefits and industrial promotion." "Formation of shareholders and shares that can be led by ICT companies which was originally planned when internet-only banks were introduced must be a requirement to continue innovation centered on customers." said CEO Yoon. "Low shares of ICT companies can lead to innovative results that were shown for the past year ending as single experiment." Chairman Choi Jong-ku of Financial Services Commission, who was also in attendance, implied importance of reexamining banking and commerce policy. "In 1982, when banking and commerce policy was introduced, supply was always lacking compared to capital needs and large corporations were monopolizing financial companies' funds." said Chairman Choi through a congratulatory message. "However, financing methods of companies have become diversified and social and institutional surveillance systems towards large corporations have become more strict." He also said that while banking and commerce policy needs to be kept as a basic principle of financial industry, it is necessary to discuss about having regulations on internet-only banks conform to international standards. However, some also pointed out that this issue with banking and commerce policy needs to be approached carefully due to public concerns. Because banks becoming weaker can have huge impact on national economy, some say that there are more harmful effects than benefits. "It is ncessary to be careful with processing of revised bank-related laws that are currently pending." said Professor Meng, Soo-seok of Chungnam National University. "While sticking to banking and commerce policy for regular banks, it is necessary to look for ways to consider exceptions and additional supplementing measures for internet-only banks."